The Discoverers: A History of Man’s Search to know his World and Himself. First edition of this “grand and exhilirating voyage, a bold attempt to circumnavigate the intellectual globe” (The Philadlephia Inquirer). Thick octavo, original black cloth. Presentation copy, inscribed by the author on the front free end paper, "For Ed Pellegrino with admiration and thanks from Dan Boorstin". The recipient, Ed Pellegrino, was a noted bioethicist and the president of Catholic University. Pellegrino is specifically thanked in the acknowledgment section of The Discoverers and both were premier academic figures at the time of the book’s publication. Fine in a near fine dust jacket. A nice association. "A remarkable narrative of the grand intellectual venture of humankind, rich in fascinating, often dramatic details" (The Wall Street Journal). "A sumptuous, totally engaging panorama. No one who reads it will look at the chronicle of human ingenuity in the same way again" (David McCullough). New York: Harry N. Abrams, Publishers, 1991. First illustrated edition of this classic work. Octavo, two volumes, original cloth. Inscribed by the author on the front free end paper in the year of publication of both volumes. Volume one’s inscription reads “For Hope and Sam- good friends, good neighbors- with affection from Dan Oct. 14, 1991.” Volume two’s inscription reads, “For Hope and Sam- with affection over many years from Dan Oct. 14, 1991.” Both volumes are in fine condition, as is the slipcase. A nice association. The Daniel J. Boorstin Reader. New York: The Modern Library, 1995. 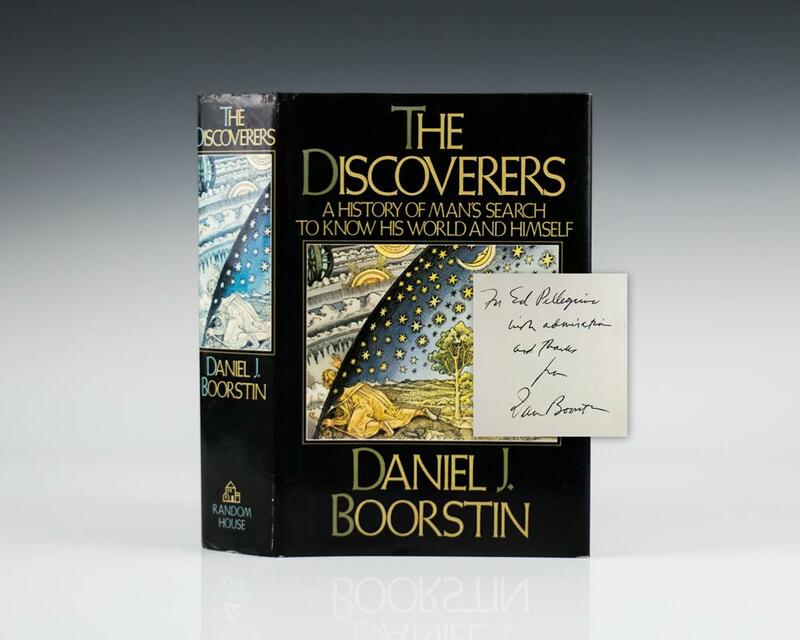 First edition of this compilation of the works of Daniel Boorstin. Octavo, original cloth, pictorial endpapers. Boldly signed by Daniel J. Bernstein on the title page. Fine in a near fine dust jacket. Introduction by Roderick MacLeish. The Americans: The National Experience. First edition of Boorstin’s Francis Parkman Prize-winning book. Octavo, original cloth. Presentation copy, inscribed by the author on the front free endpaper, “For Dr. Frank Rufords with the admiration and warm regards of Daniel J. Boorstin April 9, 1966.” Near fine in a very good dust jacket. Jacket design by Anita Karl.